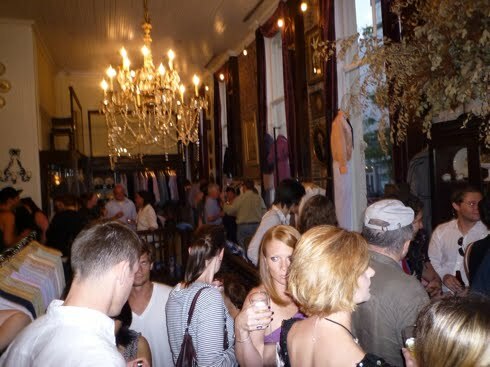 This past Saturday, GQ‘s 2010 New Men’s Designer of the Year and grandmaster of tailored Southern cool Billy Reid made a trip north of the Mason-Dixon to throw a down-home porch party at his eponymous label’s NY outpost. In support of their participation in the annual Big Apple Bar-b-q Block Party, the Alabama-based designer brought in Birmingham favorite Jim N Nick’s Bar-B-Q to roast a whole pig right outside the storefront steps. Deep-South pit meisters and downtown style hounds brushed elbows around neverending trays of ungodly delicious pork tacos and a keg of Jim N Nick’s own house brew (suitably named Reverand Mudbone)—all the while trying not to get cole slaw on the shop’s impeccable vintage-feel ties and oxfords. It was the perfect salve for a balmy evening—as relaxed and effortlessly charming as you’d expect from a southern gent like Mr. Reid. ← The Whites…in your home? ?